Fr Michael Keane, the Co Mayo clergyman who founded Knock Marriage Bureau 43 years ago, has died at the weekend. He was 85-years-of-age, originally from Claremorris, Co Mayo. Fr Keane was a priest in the archdiocese of Tuam, he was dubbed 'Ireland's Cupid Priest' by the popular press after founding the Bureau in 1968. The Marriage Bureau, which is now run by Canon Joseph Cooney, is still prospering, despite the success of the internet and other dating agencies. Since 1968, it has been responsible for almost 900 marriages and more than 48,000 introductions. In a recent interview, Fr Keane explained his reasons for establishing the bureau. In the late 1970s, Fr Keane, then Dublin based, became embroiled in controversy when was stripped of his priestly duties when he argued with his parish priest over how the parish should function. He was evicted from his parish home and forbidden to say Mass in public. 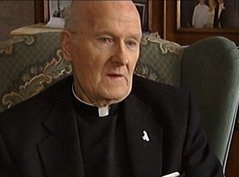 In the year 2000, Fr Keane was reinstated by the then Archbishop Desmond Connell. The reconciliation came as a great relief to then 75-year-old after more than two decades of feeling shunned and isolated. Fr Keane will be laid to rest on Tuesday following Requiem Mass at midday in St Colman's Church, Claremorris.